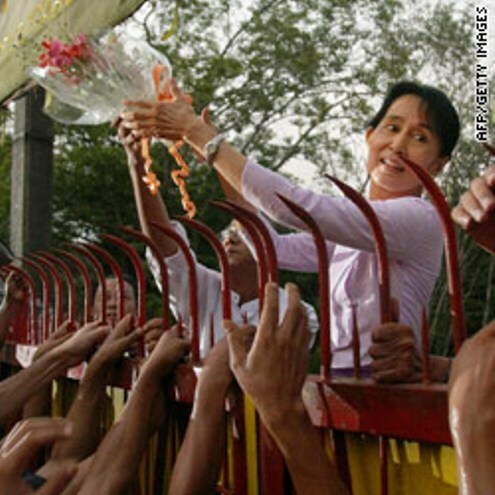 November 13, 2010 (KATAKAMI / CNN) -- Myanmar's ruling military junta released democracy activist Aung San Suu Kyi from house arrest Saturday to a throng of supporters trying to reach out and shake her hand. "I'm very happy to see you all again," she told the crowd gathered near her lakeside home in Yangon. More supporters waited at the headquarters of Suu Kyi's National League for Democracy. The Nobel Peace Prize laureate has spent 15 of the past 21 years under house arrest for her dogged opposition to authoritarian military rule in the nation formerly known as Burma. Recently, she had little outside human contact except for two maids and visits from her doctor. Sometimes, she spoke to supporters over the wall of her compound. U.S. President Barack Obama said he admired Suu Kyi's courage. "While the Burmese regime has gone to extraordinary lengths to isolate and silence Aung San Suu Kyi, she has continued her brave fight for democracy, peace, and change in Burma," he said in a statement Saturday. "She is a hero of mine and a source of inspiration for all who work to advance basic human rights in Burma and around the world. The United States looks forward to the day when all of Burma's people are free from fear and persecution." Security has been stepped up in Myanmar, but it was unclear whether it was related to Suu Kyi's release or the country's first elections in two decades that were held last Sunday. Though Suu Kyi has had minimal contact with the outside world, reports from her domestic lawyer indicate she is in good spirits, said Jared Genser, another one of her lawyers who is based in the United States. "I am personally delighted for her, for her family," Genser said. But he tempered his joy with words of caution. "I don't speak on her behalf as to what comes next," Genser said. "The challenges are enormous." He said it was unclear whether anything would fundamentally change in Myanmar, given the recent "sham" elections in the country. Benjamin Zawacki, Amnesty International's Myanmar specialist, said it made "perfect sense" for the regime to free her since she was no longer an electoral threat to them. Suu Kyi's opposition party won the 1990 elections by a landslide but the regime never recognized those results. The election Sunday was the first since then but Suu Kyi was barred from participating because of a recent conviction. The ruling military junta has been slowly releasing official election results, but critics say a victory for the ruling Union Solidarity and Development Party is all but certain. The Burma Campaign UK, which promotes human rights in Myanmar, accused the ruling junta of rigging the November 7 election. The group welcomed Suu Kyi's release but warned that it should not be interpreted as a sign that democratic reform is on the way. "The release of Aung San Suu Kyi is about public relations, not democratic reform," said Zoya Phan, International Coordinator at Burma Campaign UK. "I am thrilled to see our democracy leader free at last, but the release is not part of any political process, instead it is designed to get positive publicity for the dictatorship after the blatant rigging of elections on 7th November," Phan said. Suu Kyi's latest house arrest came after she was found guilty of breaching the terms of her house arrest after American John Yettaw swam uninvited to house and briefly stayed there. The regime passed a law that made her ineligible for Sunday's elections because of that conviction. Over the years, Suu Kyi has repeatedly challenged the junta and discouraged foreign investment in Myanmar. In one incident in 1998, soldiers prevented her from leaving Yangon. But Suu Kyi refused to turn back and was detained in her minivan for almost two weeks.